KU’s 2010 basketball season ended unceremoniously in the second round of the NCAA Tournament, as they fell to Northern Iowa 69-67. Their loss took the luster off a brilliant 33-3 campaign that captured the imagination of Jayhawk fans everywhere, hoping for a repeat of Kansas’ miracle run to the championship in 2008. Senior guard Sherron Collins ended his career with more wins than any other KU basketball player ever, but fell short of his ultimate goal. On March 29th Cole Aldrich announced his intention of going to the NBA, and on April 7th, Xavier Henry followed suit and declared for the draft. It is possible that even C.J. Henry will not be back (although he has stated he is returning), leaving the task of winning an NCAA championship to others. KU’s 2009-2010 squad was beset by internal problems from the outset, and the Jayhawks never seemed to find their identity—glossy won/loss records notwithstanding. Most disturbing from a fan’s perspective were the indications that Bill Self was coaching hustle and effort as much as he was offensive and defensive strategy. When this happens, any team will eventually be beaten, regardless of its talent level. Jayhawk fans have more to look forward to in the future than they might realize, however. Even with the graduation of Sherron Collins and the departure of Aldrich and Henry, there is a wealth of talent returning to KU next year—enough for the Kansas Jayhawks to make a run for the NCAA championship that seemed theirs for the taking in 2010. Wilson NCAA Replica Game Basketball, Official - 29.5"
KU didn't reach their goals in 2010, but the future looks bright. And lots of excitement in Allen Field House, the "Home of the Jayhawks." Centers: Jeff Withey, Markieff Morris. Power Forward: Marcus Morris, Thomas Robinson. Small Forward: Mario Little and Brady Morningstar. Point Guard: Josh Selby, Tyshawn Taylor and Elijah Johnson. Shooting Guard: Travis Releford, Tyrel Reed and Royce Woolridge. The beauty of this team is its versatility. Every returning player except Jeff Withey is able to play multiple positions, which gives this deep roster many possible combinations for lineups. Markieff Morris and Thomas Robinson can play either center or power forward, and Marcus is capable at either forward spot. Mario Little can swing to power forward while Brady Morningstar can play guard. In the backcourt, Taylor has experience as a shooting guard while Elijah Johnson has a reliable outside shot. Tyrel Reed is a superb three-point shooter and competent ball handler, and Travis Releford can switch between shooting guard and small forward. There are so many possibilities; Bill Self has to be optimistic. The returning big men must refine their games to compete for an NCAA championship. They have a wealth of talent, and in the offseason they should seek to add to their skills and abilities—particularly the ability to finish strong at the basket. If Jeff Withey and the Morris twins can gain strength without losing speed or quickness, they will comprise one of the most skilled, athletic frontcourts in the country. Although his minutes remain limited, Withey could still surprise everyone with his skills while Marcus and Markieff Morris have the ability to hit from outside and pass the ball down low—two main ingredients of Bill Self’s high-low offense. Thomas Robinson has become a monster inside with his formidable strength and speed. When he learns to play under control, he will be a tough matchup for opposing big men. Any of the four could end up starting, and competition for playing time at the center and power forward positions should be strong. Mario Little is a jump shot away from being a better college forward than Xavier Henry. During his junior season, he showed the ability to post up and overpower smaller defenders, drive on taller players, and hit the mid-range shot—all qualities we hoped Xavier Henry would exhibit while he contented himself with three-point shots. Little is already a versatile player that can create mismatches for opposing teams, and a perimeter shot is the only missing ingredient to becoming a very good player. It is uncertain when and if he will rejoin the team, however. In the meantime, Brady Morningstar returns for a final season at small forward with his shooting, passing and defense. Josh Selby is one of the most highly rated players ever to attend KU, and should step in and help immediately. If Selby lives up to his top-player billing, he could be better than Sherron Collins from the very beginning. Tyshawn Taylor must improve his shooting and passing skills to expand his game and eliminate an over-reliance on driving to the basket. If he progresses in these two areas, he will impact the game as significantly as Mario Chalmers once did. Elijah Johnson has shown promise as a shooter and distributor—he lacks only experience, and KU fans should be excited to see him take the court as a sophomore. A backcourt of Taylor and Johnson would give KU tremendous speed and allow them to press more often and effectively if they choose. Tyrel Reed provides strong shooting and better-than-advertised defense and ball-handling as a third guard. 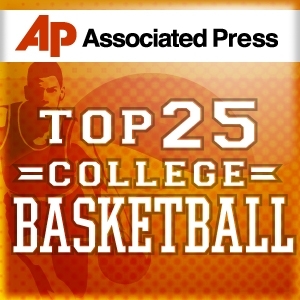 The X-factor in KU’s backcourt will be Travis Releford. Releford has the size to match up against taller guards, and if his game has improved during his red-shirt season, he has a chance to make a major contribution at guard and small forward. A more reliable jump shot hopefully will be a by-product of his year on the sidelines. Expect Royce Woolridge to settle for mop-up duties while he learns the game. After Texas ended Kansas' 69 game winning streak in Allen Field House, the Jayhawks have won four straight in impressive fashion. Perhaps the loss took some pressure off KU--they had been letting leads slip away and hanging on to win before the loss--now they are routing opponents. KU is still a game behind Texas in the conference standings at the halfway point, and it is starting to look as if the Longhorns could run the table. Kansas has been nursing injuries during conference play, with Josh Selby sitting out against Nebraska as a precautionary measure. It is believed Selby could develop a stress fracture in his foot, which would effectively end his season. He does not yet have a fracture, and hopefully resting for a few games will help the situation. Tyrel Reed is also playing on a bad foot, although it has visibly affected his play in only one game. Meanwhile, Travis Releford has been slow getting back into shape following an ankle sprain several weeks ago. Despite the bumps and bruises, the Jayhawks appear to be rounding into post-season form. Marcus and Markieff Morris are starting to dominate inside, Brady Morningstar has shaken a shooting slump and is playing the best basketball of his career, and Tyshawn Taylor is playing within his means and limiting turnovers. Thomas Robinson appears to have been motivated by recent tragedies in his family--he is playing his best basketball, as well. KU still needs to defend inside better, but they are improving and seem worthy of a high seed in the NCAA Tournament. 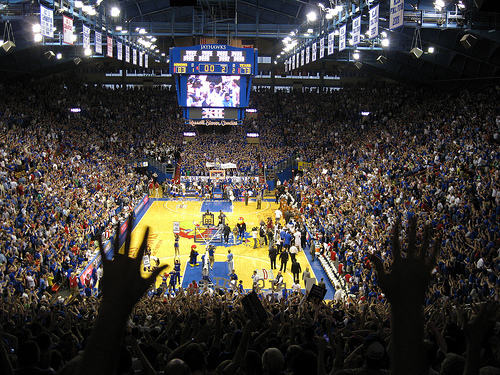 Kansas' 69-game winning streak in Allen Field House was ended by the Texas Longhorns. It was almost four years since their last loss to at home, and stunned Jayhawk fans witnessed the end of something special. Ohio State is the lone unbeaten team in college basketball, fueling questions about whether they can finish the season undefeated. The Buckeyes are good but not that good, and it seems only a matter of time before they will be upset by a Big 10 rival. KU dropped to 5th in the polls after losing to Texas, but the teams ranked #2-5 all subsequently lost, and the next week found KU back in their familiar spot at #2. KU's 22-1 start to the season has allowed them to supplant North Carolina as the team with the second-most victories all-time in college basketball. The Tar Heels have struggled at the start of the season, and KU currently has four more victories all-time. Kentucky still has 18 wins more than KU, but the Jayhawks are having a better season than the Wildcats and are slowly gaining ground. KU is starting to show flashes of greatness unsuspected at the beginning of the season. There is much to be excited about; the Morris twins continue to excel with their size, speed and athleticism. Even Bill Self admitted the twins were better than he believed they would be when he recruited them. When both Markieff and Marcus play well, they are very difficult to defend. Thomas Robinson has also played well after a poor exhibition season, and hopefully Robinson can continue to make a contribution. Nearly everyone Bill Self has sent into the game has made a contribution. A reliable bench is a huge advantage in any game. KU will have the ability to wear down opponents with their depth. KU leads the nation in field goal percentage, three-point field goal percentage and assists. They are very efficient on offense. With both Morris twins capable of shooting from long range and passing well, Bill Self's beloved high-low offense is back in full force. Steady outside shooting from the perimeter players keeps defenses from collapsing in the paint, and KU's frontcourt players have scored many easy baskets inside. While not as good as their offense yet, KU's defense has been very good so far and is steadily improving. They are a different team defensively than last year's squad, relying on steals from pressure defense. While they are more active on defense, they do not defend the basket as well as they have in years past. It no longer seems likely that Jeff Withey will provide meaningful minutes at center, which means KU will need to speed up the game to protect the basket. The Jayhawks have met every challenge so far, and are about to become improved. There should be some enjoyable moments ahead for KU fans. Off-court problems must vanish. Fights with the football team, DUIs, Facebook venting, accusations of lewd behavior in elevators and parents with agendas distracted the Jayhawks in 2010, and there was a feeling of deja vu when Mario Little was arrested for battery just before the Christmas break. It is uncertain how the many distractions KU’s team faced last season affected their chemistry or performance, but a commitment to excellence must be ongoing--not just after the ball is tipped. The Jayhawks lose the most physically imposing players on their team with the departures of Sherron Collins, Cole Aldrich and Xavier Henry. They will no longer intimidate opponents with size and strength alone. As a result, the Jayhawks must emphasize speed, quickness and efficiency. They will win games with a scrapping, hustling style that emphasizes movement. Improved strength and conditioning without sacrificing speed and quickness will be vital to their success. Bill Self can’t be coaching effort if KU is to be successful in 2011. Everyone on the team must perform to their capabilities every night, and the days of surrendering big leads in the second half and holding on for a narrow victory need to end. With so many returning players, the opportunity exists to expand their offensive and defensive options, making KU harder to prepare for. All the strategies in the world are wasted if the team continues to demonstrate the listless play that so often characterized their 2010 efforts, however. KU needs new leadership, on and off the court. Aldrich and Collins might have had limitations as players, but they were outstanding leaders and possessed a will to win. No one on the roster has the presence of Collins, who infused the Jayhawks with toughness. Who will step up and lead in 2011? Marcus Morris and Tyshawn Taylor are likely choices because they are returning starters, but Josh Selby will become the Jayhawks’ leader by the end of the season. Taylor's play has inexplicably suffered from Selby's arrival, and unless he can regain his confidence and display the judgment he demonstrated in KU's first nine games, the team will soon belong to Selby. The future is bright on Mt. Oread. KU’s nucleus is talented enough to play with anyone in the upcoming season. A 33-3 record might not be a practical goal, but the Kansas team will remain a strong presence on the basketball landscape. They will be strong, and with a little luck—very strong. KU has always had a strong walk-on program of players invited to join the team on a non-scholarship basis. Christian Moody, Matt Kleinmann, C.J. Henry and Connor Teahan are four recent players who have helped the University of Kansas with their desire, their strong work ethic and their talent. 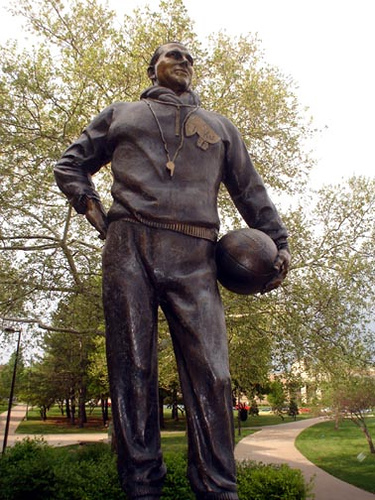 Moody actually started for KU during portions of his career, and Billy Packer dubbed him the greatest walk-on "in the history of NCAA basketball." Two players with ties to the Jayhawks will join the team in the 2010-2011 season as invited walk-ons: Justin Wesley, a 6'8" 205 lb. sophomore transfer from Lamar University who is the brother of KU player Keith Langford; and Niko Roberts, a 5'10" freshman guard from St. Anthony's High School in Long Island, New York. Roberts is the son of former KU assistant coach Norm Roberts. The addition of these players gives KU four walk-ons for the upcoming season, joining Teahan and Jordan Juenemann. C.J. Henry and Chase Buford opted not to return for the 2010-2011 season. Zach Peters, a 6'9" 235 lb. sophomore forward from Prestonwood Christian Academy in Plano, Texas verbally committed to join the Kansas Jayhawks basketball team. He has been compared to former North Carolina star Tyler Hansbrough, and had also been heavily recruited by Kentucky, North Carolina and Texas. Peters averaged 15.3 points and 9 rebounds a game as a sophomore and is said to possess the skills to play either forward position. He is considered to be one of the top prospects in the class of 2012. A second member of the class of 2012 is hoping to suit up for the Jayhawks: 6'2" 175 lb. point guard Nino Jackson from Ardmore (Oklahoma) High School. He is said to be very quick and possesses a good jump shot. Jackson is considered to be one of the best junior-to-be point guards in the country with a chance to jump into elite status, and told the local newspapers he would like to play for KU. Jackson has now been offered a scholarship to play for the Jayhawks and is expected to eventually sign with KU. KU signed point guard Naadir Tharpe from Brewster Academy in Wolfeboro, New Hampshire to play for the Jayhawks in the 2011-2012 season. Rivals.com's No. 91 rated player chose KU over Oklahoma, Minnesota, UCLA and others. Tharpe averaged 13.0 points and 6.0 assists per game last year for 35-5 national prep champion Brewster. He has been compared to former KU point guard Aaron Miles. KU is believed to a heavy favorite to sign DeAndre Daniels, Rivals.com's No. 9-rated recruit in the class of 2011. It is believed that Daniels is waiting to learn how much financial aid he can receive to sign with the Jayhawks before the spring semester. His plans are to practice with the team but not play in games until the 2011-2012 season, when a scholarship would become available. Kentucky rescinded a scholarship offer to Daniels, leaving KU and Texas in the hunt. Other recruiting rumors: KU is also said to be in the running for Perry Ellis, a 6'8" sophomore forward from Wichita Heights (Kansas), and 6'5" Ben McLemore, a 6'5" forward from Eskridge High in Saint Louis. Both players have done well on the AAU circuit and would certainly help the Jayhawks down the road. 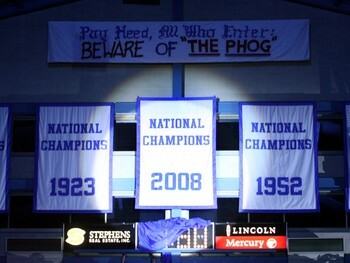 How well will the KU Men's basketball team do in the 2010-2011 season? Rotten! They'll be awful without Sherron Collins! Wilson NCAA Final Four Edition Basketball, Official - 29.5"
Thanks, Matt. I hope they continue to play well this season. Barrett, thanks for stopping by. I agree that this should be a great year for KU. Josh Selby is important--if he is cleared to play soon, KU has a chance to be great. Quills, thanks for posting the link. I appreciate it and I suspect others who visit this page will, as well. Thanks again. Mike, do you know when the '10-'11 schedule is determined/published? Any links? Bob, thanks for your comments. I hope Selby lives up to the hype because it would make for some very exciting basketball, but I agree that either if he is only decent, KU will be fun to watch. Thanks again for your comments. rml, thanks for reading. Selby should be very good for KU if he can come close to his lofty credentials. It will indeed be an enjoyable season. Thanks again. I am eagerly looking forward to basketball season. KU will be fun to watch with the addition of Josh Selby. Go Hawks! newdiabolic, thanks for checking back. It is disappointing to hear that Jones really did reach for the Jayhawk cap. I know he was likely just building suspense and/or being playful, but it makes the kid disliked by everyone who was hoping he would become a Jayhawk. No big deal in the long run, but folks remember stuff. I knew they weren't playing games in Allen Field House, but I missed the reason why. If it was mandated by the NCAA, it must have been considered an unfair advantage. I'm not sure I know who KU ever signed as a result of their playing in Lawrence, but I will accept that there likely was an advantage. It probably is a shame to make the kids play in the high school gyms or community centers. I'm certain it isn't the same. I saw a team at the local Applebee's and they sure looked young. I know they ARE young, but it is still shocking in a way. I found it amusing that they were seated by a very beautiful young lady, but all twelve sets of eyes were glued to Sports Center on the big screen television. Now that's focusing on your game! Should be some interesting days ahead. Yeah it's there now. No worries, just curious. Oh, and just to let you know, I was watching the press conference and he did in fact reach for the KU hat. As for how much holding these tournaments helps, I don't know either but apparently the NCAA thought it gave them some recruiting advantage because they aren't allowed to have games in AFH anymore. I might have hit the wrong button. You should be able to see it now..... whew. Hey Mike. Just checked in to see your response. Don't have much to add at this point, but I'm wondering...where's my last comment. You obviously read it, but from my screen at least, my last comment is missing. newdiabolic, thanks for coming back. I remember Maurice Evans very well, and Korleone Young was an interesting story. He played AAU ball with Brandon Rush's older brother Jaron, and Roy Williams heavily recruited them both. Young had the "NBA ready" body but as you put it, was kind of a punk. The recruitment of Jaron Rush and Korleone Young was probably Roy Williams' darkest days as KU's coach. And yes, I enjoyed the Jayhawk careers of Steve Woodberry and B.J. Williams. I still have hopes that Travis Releford could become a Woodberry type player, but I fear all they have in common might be a similar height and weight. Too bad about Terrence Jones. I didn't see the press conference announcing his decision, but I saw in the local papers that he reached for a Jayhawk hat before picking up his Washington Huskies cap. Baron Davis did that when commiting to UCLA, and I think Roy Williams never forgave him. Don't know if Jones really did that or not, but there is a mocking quality to that kind of action that I find distasteful. He should just announce where he's going and leave the dramatic build-up out of it. And, of course, I share your opinion of Calipari. I'm starting to believe he is bad for the game of college basketball. Frankly, you have to root against him and hope he never wins an NCAA title with his one-and-done teams, because if he ever did win it all, he would surely be even more aggressive in promoting the "win-a-title-and-go-pro-in-a-year" philosophy. I prefer one and done to going pro out of high school, but I'm not sure Calipari's approach is good for the game. If he fails to land the top recruits once in awhile and has to actually build a team over time, it would suit me fine. His last ditch effort to change Terrence Jones' mind was totally without class, and I am ashamed that Calipari was ever associated with KU. With Jones out of the equation, KU can focus on the team they have, which should be more than adequate. I doubt there is anyone left out there that Self would want, so if maybe he should give Conner Teahan a scholarship for this year. I was still hoping Jones would sign, but I am a huge fan of Mario Little and I think he will certainly surprise people. I have no problem getting early commitments out of players on campus this weekend if they want to commit. I know it is a benefit of holding tournaments like this in Lawrence. It would probably be hard to quantify how much holding a tournament helps in recruiting, or even to say if it does help, but it couldn't hurt. Glad to see you read some of my other articles, whether they were basketball related or not. I'm not surprised that you had different opinions on my Ginger and Mary Ann quiz, but that's actually a big part of the joy of writing things like that--to see how people differ and why. I wrote a lot about KU this season and also wrote some more general articles about the NBA and the one-and-done phenomena. If you ever have the time, check them out. You're right, it will be a long six months before the Jayhawks tip off again, and I hope that whatever news that comes out about the basketball team has nothing to do with DUIs, fights with football players, or anything else we got a taste of last year. Well, thanks for your comments as always, and feel free to return. 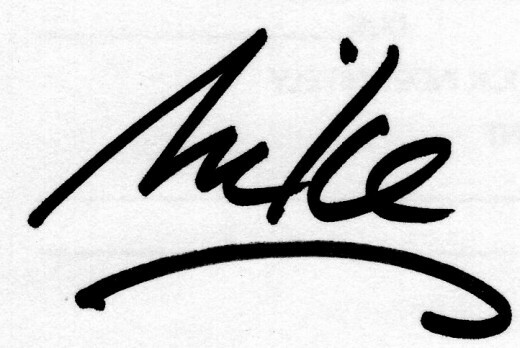 Hello Mike. Yes I am indeed a Wichita man. Not only were Darnell Valentine, Antoine Carr, & Aubrey Sherrod all from Wichita, they all went to my alma matter Wichita Heights. Wichita produces some decent talent every once in awhile. Steve Woodbury and BJ Williams are both from Wichita. Woodbury was an excellent player, Williams was a solid bench guy. A few years back Roy Williams heavily recruited Maurice Evans, who chose Wichita State and after two seasons transferred to Texas. He still plays for the Atlanta Hawks, has averaged almost 20 mpg over his career. And way back when I was in high school I was at a game where Roy was in attendance to watch a player from Wichita East named Korleone Young. He was kind of a punk from what I heard, and got some bad advice and declared for the draft. The Pistons took a flier on him in the 2nd round, but he was a complete bust. Anyway, hopefully Perry will don the crimson & blue in a couple of years (espn currently has him ranked as the #8 player in the class of 2012, and Self has been down to see him several times already). I checked out some of your other pages. I even took your "either/or" quiz. We differed on maybe half of the topics. Ginger, Jeanie, Star Wars, Jennifer Aniston, Kobe Bryant. For a news channel I prefer MSNBC over CNBC, and refuse to watch Fox News. I have very few memories of WKRP in Cincinnati, but having viewed the show as a young boy I do have vague recollections of liking both women on the show. I was a huge X-Files fan. I like Supernatural, but I think Fringe has overtaken it as my favorite weird sci-fi show. As I can see you're a fellow sci-fi fan, I really liked the newer Battlestar Gallactica series that recently ended. I'm also a fan of all things Joss Whedon, so Buffy hands down over Charmed. As for Bonds, didn't like Brosnan, and maybe because of my relative youth I just don't have the passion for the older Moore & Connory Bond films. I liked Timothy Dalton, but the last two Daniel Craig installments are by far my favorites. Wow! Quite simply, John Calipari is the worst person in all of college basketball. What a completely classless, low-life loser! Come on Cal, I know your legacy took a hit with yet another recruiting loss, but calling the kid just after he announced to try and guilt him into changing his mind? What a sorry excuse for a human being. I wish the NBA would do the college basketball world a favor and take this scum off of our hands. Anyway, assuming he stays committed to Washington, that is just fine with me. I'll admit I got caught up in the hype of wanting him to come to KU, but I think it was just to boast about another recruiting victory. I'm glad Little will be given every chance to play his senior season, and most of all (again, assuming his decision stands) I'm happy Calipari didn't manage to ensnare him with his tentacles. Well, no anticipated big news on the horizon. I've heard some rumors that KU could potentially get another verbal committment from one of the underclassmen playing in the Jayhawk Invitational this weekend. There are some studs that have KU on their lists: Ellis, Shabazz Muhammed, Ben McLemore, & Angelo Chol. Again, just rumors, nothing more. Regardless, losing out on Jones more than likely brings an end to any big happenings in the news for next year's team. Gonna be a long 6 months 'til they tip off again. Newdiabolic, thanks for coming back. You're a Wichita man, are you? KU greats Darnell Valentine and Greg Dreiling both came from Wichita, and I wish you could have seen the Wichita State players from the early 80's: Antoine Carr, Cliff Levingston, Aubrey Sherrod. Those guys could play, and in 1981 they beat KU in a regional semifinal game. It was a tough blow for KU, needless to say. I agree that the transition from what KU was in 2009 and what they became in 2010 could have hurt them. If the mix could have been found last season to duplicate the no-star team of 2008, they might have gone further in the NCAA Tournament. Collins did try to do too much against Northern Iowa, and it seemed throughout the season that players sometimes waited for Collins and Aldrich to bail them out rather than take over themselves. One key exception was Marcus Morris, who on several occasions clearly played as hard as he could to keep us in games. Without the acknowledged "stars" next season, perhaps it could be a bit more like it was in 2008. I am also a huge fan of Mario Little and would hate to see him miss the chance to show what he could do in 2011. I love a guy who creates mismatches, and I think that is his strong suit. Too fast for the tall guys and too strong for the quick ones. I have said that if he could improve his jump shot, he could be better than Xavier Henry was. The question becomes: if Terrence Jones believes he is a "one and done" player and came to KU, would it be perceived as Self "holding him back" if he came off the bench? I hope that it wouldn't, but it seems obvious Jones would see himself as a starter if he came here. You're right, you have to get the talent when you can, but I hope Jones wouldn't hurt the team's chemistry. C.J. Henry obviously would need to be in the regular rotation to be a threat as a three-point shooter. Much as I would like to see him phased out, Brady Morningstar needs to screw his head back on straight and contribute to the team. As a sophomore he was a long-range threat even if he didn't shoot a lot, and he needs to at least be a threat. Someone else hopefully is working on their shot right now--Tyshawn Taylor, Travis Releford, Elijah Johnson--somebody. If defenses can clog the middle on KU, it will make it tough for the twins to run the high-low offense. It is odd to think that as things now stand, Marcus and Markieff might be the second and third best long range shooters on our team behind Reed. That's a weird thought. I read that Selby has a good long range shot, but it still would help for someone else to step up and be a threat to score from outside. If Taylor could be the one, it would certainly help him in driving to the basket. If defenders have to play up on him, he could go around them that much easier. He should be able to find a lane to penetrate with Aldrich gone and the faster Morris brothers inside. I should point out that while I may sound like I'm putting down Aldrich and Collins, I loved their games and they were among my favorite KU players ever. I thought there were flaws in their games, but that doesn't mean I didn't appreciate their talents. I think KU is really going to miss Aldrich's defensive presence. Hopefully KU can add an element of speed and athleticism to their defense and still be a good defensive team. Well, I look forward to learning what Jones' decision will be. KU might fly under the radar without him (and still be, as you point out, good enough to win big), but if KU signs him, they will likely be seen as an elite team again. I hope they get him, but it won't ruin my day if they don't. I do have other blogs where I occasionally write about KU, but HubPages is my primary space. I have written several articles about KU that I hope you might want to read. You can click on my name on this page and get to other articles I've written. Hope to see you there. I've greatly enjoyed the discussions and hope you will feel free to continue. As you've said, sometimes it is difficult to find a knowledgeable KU supporter to exchange ideas with. I'm glad you've enjoyed being here. Well, we shall see what Friday brings. Thanks again. By the way, I kind of stumbled upon your blog by pure chance. I'd never heard of hubpages. I'm curious as to if you blog regularly on KU and if so how would I know where to go. Right now I just have this blog bookmarked, but if you were to post a new one it's doubtful I would notice. Any advice? Hey Mike. This is a fun little back & forth we got going. It's at times hard to find people to have intelligent, reasonable conversations with. The Terrence Jones situation opens up a whole new can of worms. I still don't think we "need" him to be able to compete for the highest stakes next year, and I'm not sure bringing him in increases those chances either. He appears to be a great player and I'm of the opinion that you always grab talent if it's available, for you don't know when that particular talent will come around again. However, we've already discussed how players will have to fight for minutes next season, bringing in another top 15 recruit will only make it tougher. Does it create chemistry issues? And because I think his best chance to see minutes is at the 3, what does that mean for Mario Little? I don't know that Jones for sure beats him out for the starting spot there. If he doesn't, how does he handle a bench role? If he does, that likely squeezes out Mario of any significant minutes. I'd really hate that, for one because I think he can be a really good if not great player next year, and two because this is his last go-around. He red-shirted last year because it was believed he'd have a better chance to see minutes next season. It would be a tragedy if he came here and never ends up with any real opportunity to shine. That being said, Coach Self's obligation isn't to any one player, but rather to field the best team, and if we bring in Jones I guess we'll just see how it shakes out. Yeah I was born in '78, so I'm not too familiar with the Darnell Valentine years! Freshman point guards have had some success, but I couldn't think of an example of a team winning a National Championship starting a freshman point guard. A few have come close. Mike Connolly Jr. a couple of years ago at Ohio State. And whoever was the point guard for the Michigan Fab Five team (Jackson, King, or Rose?). Obviously Derrick Rose with Memphis in '08. As for one-and-done players in general, I think Carmelo Anthony is still the only one to accomplish the feat. I'm not sure that we had any locker room chemistry issues, or to put it another way it didn't seem like there was any decension or bitterness. The guys all seemed to really like each other. I think it was way the team was built that was ultimately its undoing. I love Sherron too. One of my top...10 favorite Jayhawks, maybe even top 5. But with him and Self both declaring that it was "his team", it just didn't equal a great recipe for success. In hindsight the over-achievement of the '08-'09 squad may have hurt us in the long run. Having Sherron carry the team so much that year and experiencing decent success doing it had too much of a carry-over effect into this past season. It didn't happen as much this past season, but we would occasionally see what the Lakers sometimes experience with the "Kobe Bryant effect", teammates at times standing around, one guy trying to do too much. In the loss to UNI, it was clear he was trying to do too much. I don't think there's just one clear-cut way to win a championship, but I'd like to see more of a return to the '08 approach. Not having one leader, but rather having a cohesive team of 5 guys all capable of scoring and having the best option be the open guy. Last year's team did seem a bit down defensively, but we still finished 4th in FG% defense at 37.9% (Florida St. & St. Peters led the NCAA holding opponents to 37.7% shooting). So it wasn't horrible from that standpoint. Like I said, I attribute much of it to Aldrich. You are right that when matched up with someone physically his equal he did shrink to an extent. But our perimeter defense was lousy, and the team did not wreak havoc on defense in terms of on ball pressure, steals, forcing turnovers, etc. To fully take advantage of our athletic potential next year we must be able to play at a faster pace and get out & run more, which is near impossible to do without high-level perimeter defense. As for the 3 point shooting, it'd be nice to think one of our guards will improve enough to be a reliable threat. You're right CJ did display a good shooting touch, I just have a hard time seeing him getting many minutes, and if you have to have a 3 how much confidence can we have bringing him off the bench cold late in the game? Anyway, like you said the Jones announcement will be big news Friday. I guess he said he had a great visit and that "Kansas is one of my options, and they are even with the other schools." Wish I could see some of the Jayhawk Invitational games this weekend. I live in Wichita and am a former Wichita Heights graduate, so I'm really hoping to see Perry Ellis in the crimson & blue a few years down the road. newdiabolic, thanks for coming back again. I find myself curious about how things went today with Terrence Jones. Last week I figured KU was deep enough and didn't need him. I even feared creating a kind of "Kentucky II" scenario where KU and UK are competing for one-and-done players, trying to bring in more and more freshman talent each year instead of developing players. This week, I must confess I sure would like to see Jones sign with the Jayhawks. A ton of talent overcomes a lot. Regarding your key issues--you are correct that despite the depth on KU's roster, they are still shy on experience. The twins, Taylor, Morningstar and Reed represent most of their experience. Perhaps Robinson could be included, but while he got into most of the games, he wasn't in some of them for very long. With so much depth, it's true that no one player must improve except (as you say) Selby. With his credentials he will need to be on the court, and hopefully he will be mature enough to run the team. I will show my age here by thinking back to 1978, when KU recruited freshman point guard Darnell Valentine to run a great team. He was up to the task and did a superb job. Unfortunately, a very talented sophomore point guard named Hassan Houston didn't like the lack of playing time and left KU. I hope Selby can truly run a team as a freshman, and I hope Elijah Johnson will stick around and compete. Team chemistry will be huge for KU, and I never really thought they had it in 2009-2010. They acted like they had it, but it didn't really show. Rumors suggested Carl Henry tried to influence how things went, and then of course there were the incidents with Tyshawn Taylor (multiple incidents) and Brady Morningstar. It's also possible that the star treatment Aldrich, Collins and Henry received didn't sit well with some of the others--who knows? All that stuff needs to go away as soon as possible. Chemistry will need to show itself on the court, also. Five guys need to play hard and play together. I loved Aldrich, Collins and Henry as players, but KU might be a better TEAM with them gone to the pros. You are absolutely correct about KU's defense. I was disappointed in virtually everyone on defense--even Aldrich. It seemed whenever Aldrich played someone close to his own size, the other guy at least matched him and often outplayed him. Look how focused that guy from Northern Iowa was, for example. Collins always seemed too short and Henry never seemed like he was going at full speed. Henry led the team in steals, but never seemed to want to try and shut down his man. Reed improved on defense but Morningstar regressed. Taylor was good but didn't seem improved from his freshman year. The twins played well but sometimes rested on defense. Robinson was energetic but unfocused. And on and on...... You're right, KU should have been good on defense but underachieved. I would love to see Self mix up the rotation a little more to play to strengths. Play Marcus and Little at both forward spots, play three guards, whatever creates mismatches. Self recruits versatile players capable of playing multiple positions, so it would make sense to take advantage of their abilities. KU has the potential to play great defense this year, with fast and mobile big men. Let's hope they can do it. I hadn't really thought about three point shooting, but you're correct--Reed is the only returning player with a reliable outside shot. Morningstar used to be in that category but regressed last season. The story is that Selby has good range. That might be where C.J. Henry finds minutes. He seemed a good long range shooter when he found his way into a game. I hate to think of relying on someone so seemingly injury-prone, however. Hopefully someone will work on their shot in the offseason--whether it is Johnson, Taylor, Releford or even Mario Little. This could be a real trouble spot. In some ways it seems that after Reed, the Morris twins are the next most reliable outside shooters. I would rather have a guard fill that role than the center and power forward, y'know? Well, Jones will be the next big news on the horizon, and I think it would be nice to recruit another impact player. We shall see. Thanks again for your comments, I truly enjoy the discussions. Feel free to come back any time. Hey Mike. Yeah I guess Terrence Jones was supposed to arrive today for his official visit. He's set to announce his choice this Friday. On the one hand, I don't know why you make a visit this close to decision day if you're not seriously considering coming here. On the other hand, I'm guessing he ends up at Washington. His mom doesn't seem to be sold on KU (she's not accompanying him on his visit), perhaps wanting him to stay closer to home. Guess we'll know Friday. As for the issue of having a true center, I'd agree that to win 6 games in the tournament at some point you'll probably need that more physical presence. I don't know that the '08 team ever "needed" that. Against Davidson Kahn came up huge, and against North Carolina Cole dominated for a stretch, but that wasn't a case of our power forwards ever being over-matched. Regardless, it's a nice bullet to have in your gun. As to the other issues you commented on: the frontcourt possibilities with Little, TRob, & the Twins are exciting. It's kinda weird, I remember watching games early in the season and the commentators would always remark about how the Morris Twins had improved, and how it was weird because they seemed to had improved the same amount. I don't know if it was because Marcus started and Markieff didn't or if it was because they are just different types of players, but once the conference season started Marcus just took off again. I'm hoping that if Markieff gets to start he can make the same kind of strides. I also agree that we'll be flying a bit under the radar, although I think we could very possibly still start out ranked in the top 10-12. The way I see it, there are four issues that are key to making next year a special season. (1) Player developement. As I have commented, only 5 guys on our current roster have seen significant minutes at the D-1 level. There are so many unknowns. I think what ultimately may solve this problem is our strength in numbers. We have so many potentially viable players that next season won't hinge on one or two specific guys making big strides. If Little doesn't pan out, we have Releford. If TRob doesn't pan out, we have Withey. And so on and so on. I think out of everyone the one guy who will need to progress the most is Selby. I can't think of many examples of teams having great success with a freshman point guard. Again, it's not critical that he becomes a true impact player as we have other options, but he has the most upside (of the "unknowns") over his peers at any position. (2) Team chemistry. This goes for both on the court and in the locker room/at practice. With so many players vying for minutes, we can only hope that those that don't see the playing time they think they deserve don't rock the boat. It is also going to be quite a task for Coach Self to sort through all the talent we have and determine what are the right combinations of players. I think that probably has something to do with his preference for an 8 man rotation. The more guys you rotate in there the less comfortable they are, both with each other and with their own roles. The season is long enough and Self is a great coach so I expect him to get it figured out, but we'll probably take some lumps along the way. (3) Defense. Last year's team was not all that good defensively, but we had the equalizer in the paint with Cole playing the ultimate defensive stopper at the rim. They were pretty awful at guarding the 3. With Cole gone everyone must step their game up on the defensive end. You can always count on having at least one game in the tournament (as well as several throughout the season) where your offense just isn't clicking, shots just aren't falling, and you have to knuckle down and win the game on defense. And even in games that you don't have to grind it out, there is almost always a game or two where there are times that you just have to have a stop. This, in my opinion, will be the greatest obstacle to overcome for next year's squad. Few young teams are great defensively, and even though we're not technically young, I'd say we are in terms of minutes played (again going back to only 5 guys with significant minutes played at the D-1 level). And (4) three point shooting. Tyrel Reed is the only returning player who could be counted on to hit a 3. Maybe Selby can be a reliable threat. Maybe EJ, Releford, or Little have developed that part of their game. Maybe Brady bounces back. It's just hard to fathom making a deep tournament run without a few more shooters, especially since the only one we can count on now will in all likelihood be coming off the bench. Well, it sure is fun to talk about it, and I can't wait to see next year's team in action. Thanks for the good conversation. I'll keep checking back, we can keep this running until we run out of things to analyze. newdiabolic, thanks for coming back. I notice Terrence Jones is in the news quite a bit lately, which makes me wonder if the Jayhawks really have a chance for him. I think he would make an interesting addition to the team, and it sounds like they are saying he would be a small forward. Obviously his inclusion would signal the end for Brady Morningstar, unless of course the new guys can't run the plays. That's what saved him last season--that and the fact that he didn't turn the ball over a lot. If he could return to the form he demonstrated as a starter in 2009, he deserves to be on the court (sometimes). If not, Tyrel Reed became the more reliable player last season. Travis Releford could compete for minutes if he worked on his shot during the red shirt season. I hope he can get on the court. I think you have the lineup for next year pretty much pegged. I agree that Taylor will likely get the nod over Johnson, but clearly I am a Johnson fan and would like to see him get some court time. I don't dislike Taylor, but I don't think he does anything exceptionally well. He is an erratic shooter and a questionable ball handler and passer. After saying all that, I still do like him. I think his athleticism really helps KU. I think Taylor, Selby and Johnson should make for a wonderfully athletic backcourt and could give the other team fits on defense if they focused on that end of the floor. I also agree that if Markieff Morris starts at center, it would be a scenario very similar to the 2008 rotation with Kahn coming off the bench. I do think a team needs a legitimate big man to really compete for an NCAA title, but I don't think the big man must be a starter. I think you must have someone on your roster who isn't overmatched when facing a true center, and hopefully Withey can end up being that guy. In defense of Markieff Morris, he and Marcus run the high-low offense really well, and I'm all for the twins being on the court together. Y'know, because he was playing injured through so much of 2009, I don't think anyone knows how good Mario Little can be, but I truly believe the guy has the potential to be a great forward. I love the fact that he can post up smaller players and drive a little on taller opponents. Nothing against Cole Aldrich (who I thought was a great player), but with a quicker and more mobile Markieff Morris at center, the twins and Little should be able to find and exploit any mismatch in the frontcourt because all three players can play both inside and out. I also think Thomas Robinson could be a beast next season. All he has to do is slow down a little and take his time. With the loss of Aldrich, Collins and Henry, KU might fly a little more under the radar, but I sincerely believe the talent is there to once again compete for all the marbles. And, it will be interesting to see how the talent end shakes out with Jones. Will he sign with KU or won't he? Thanks again for your comments, I appreciate them greatly. Hey Mike, good to hear back from you. It's a wait-and-see game with Elijah, in terms of can he progress enough in whatever was lacking that kept him from seeing the floor last season to make the jump to the starting line-up next season, and do his abilities allow him to flourish at the 2 guard spot with Selby running the team. With Little, I think it's a no-brainer. For me, him coming off of a red-shirt season is almost like bringing in another big time recruit, only he'll have a superior understanding of the system, the ability to come in and defend, and the physical aspects - strength, conditioning, build, physical maturity - that all give him an edge over anyone else. The second post spot (after Marcus) is a toss up. I think right now you have to give the edge to Markieff, but wouldn't be surprised to see TRob starting at some point. Kieff saw significant minutes his first two years, so he is no doubt more "game ready" at this point. He is more of a threat in the half-court game and has a better shooting touch from mid-long range. He has also already demonstrated a tremendous capacity for improvement. Now it's on TRob to make the same kind of commitment this summer. If he does, it's possible he could find his way into the starting line-up at some point. I love TRob's game, so I'm hopeful that he can improve enough to push for 25 mpg or more. Regarding starting either Markieff or TRob over Withey, I don't think you necessarily need a true center seeing a ton of minutes. Consider that in '08 we started Darnell & Shady, both more traditional 4s - or power forwards - than centers. We brought our centers in off the bench. Darnell & Shady saw about 24 mpg, and Sasha was the main sub in the post tallying 17 mpg. I'd like to see a more athletic team on the floor playing two 4s as opposed to trying to play through a true center. Only if you have a stud like Cole do I think that's a prudent strategy. I listed the bench players in descending order of who I think should get the most minutes, not by position. Reed is the team's only viable 3 point threat at this point, and its hard to envision a team having a great season without the ability to shoot from beyond the arc, so his specialty will be highly coveted next season. He also made great strides on the defensive end to where he was not the liability on that end of the court that he once was, although he still has some work to do. He hustles as much as anyone on the team. He should be the first guard off the bench. Then should come the 3rd post player, whether that be TRob or Markieff. Then, and almost unfortunately in my opinion, you have Tyshawn. Tyrel isn't a great option to run the point. If you start both Selby & EJ, at some point you'll need someone to come in and run the team, and Tyshawn has some experience in that area. Whithey sees limited minutes in the role of the 4th big, as foul trouble and match-ups dictate. After that you have Releford, who can spell minutes for Little at the 3 or slide down and help at the 2, maybe 10 mpg. Now I've left off some guys. Brady...sorry but his time should be up. We saw too much regression last year on both ends of the floor, and if he can't be counted on to hit the open 3 or play solid defense then it's not worth giving him minutes. As I have stated, Royce should redshirt. I think he can be a good player at some point, but he should wait to start the clock on his eligibility until after Brady & Tyrel have left (and maybe Selby as well). Spend a year in the system, learn to play defense, get your body in better condition, and come out for the '11-'12 season ready to help the team. CJ...his health issues make him too unreliable at this point. His best chance for playing time would have been at the point, and bringing in Selby pushes him further down the depth chart. Now, this is more or less my ideal scenario. However, if I had to guess, TT will start over EJ, and Brady will continue to see minutes and I think could push Releford out of the rotation. And now with the possibility of adding Terrence Jones, I could be re-configuring all this again soon. newdiabolic, thanks for returning. I enjoyed and appreciated your comments a great deal. I have expressed my hopes that Elijah Johnson will be a key player for the Jayhawks next year. I agree that defense probably kept him off the court in 2009/2010 (and, I will concede, shooting as well...). I think with his athleticism, he could be a great defender if he chooses to be. When I wrote the original article, Josh Selby had not yet committed to the Jayhawks. I wonder what Selby's inclusion will do to Johnson's minutes? I don't know if he would consider it, but perhaps Johnson would benefit from a red-shirt season as a sophomore. With Selby, Taylor, Reed, Releford, Woolridge, Morningstar and probably C.J. Henry in the backcourt, well--Johnson seems like a good candidate. Releford and Morningstar have already red-shirted, and if Johnson sat out a year, at least Reed and Morningstar would play out their eligibility next season. It might not be a bad idea for Woolridge to red-shirt also, as you suggested in your comments. I certainly hope Johnson isn't considering a transfer--that would be a shame. You raise a good point about Self's predilection for playing only eight guys and then stuffing his roster with a bunch of really talented players. I wonder if this team would have the speed and athleticism to press a bit? If they played a pressure or full-court defense, they could use more players. That doesn't seem to be Self's inclination, though. I had forgotten the comment about Withey not knowing the playbook. I hope he has the mental agility and basketball I.Q. to be a real player--I believe he has the physical tools. I have trouble seeing the Jayhawks being a great team with Markieff Morris at center. They could be a very good team, but I wonder if they could be an elite squad. If Withey could play (if not as a starter, then at least splitting time), perhaps Self could get a rotation in the middle going in the manner he did during the championship year. I think the elite teams that compete for the championship every year almost always have a good big man, and between Markieff Morris and Jeff Withey, I think they could be good enough. If Withey isn't ready, we will still be good with the twins and Thomas Robinson at center and power forward, but I wonder if we will be good enough. Well, thanks again for your comments, your opinions are very knowledgeable and always welcomed here. Hey Mike. Thanks for responding. Always nice to have intelligent conversation with fellow Jayhawk fans. I'm a big EJ supporter. I wish he would have gotten more of a chance to play. As far as his shooting goes, he may be a better shooter than he displayed, but early in the non-conference he got some chunks of minutes before the level of competition elevated and he was squeezed out of the regular rotation. With Brady suspended and CJ Henry often injured, he saw the court a fair amount of time, when most of his shooting stats were accumulated. I agree being behind Sherron didn't help his chances to see minutes, but he could have played the 2. Tyshawn was a point guard in high school and has seen most of his minutes at the 2 so far. We are left only to speculate as to how he looked in practice and as to how good of a defender he was. My best guess is that his defense was lacking, and Self looked at the situation and decided the team couldn't succeed with both EJ and Sherron being below average defenders, or with both EJ and Tyshawn both being below average jump shooters. Basically EJ had to have one or the other (defense or outside shooting) to where he was complimented by one of the other guards on the court at the time. Tyrel is a great jump shooter so his defensive deficiencies could be overlooked (and he improved his defense dramatically as the year went on), and Brady had been both a good defender and jump shooter (although I saw both regress during the season). EJ's abilities (mainly to drive & dish, speed, & athleticism) were determined to be not as important as jump shooting or defending, and thus his talent was marginilized. I do agree that last season's newcomers did not enjoy the benefits of available playing time just there for the taking as the '09 group did. With Withey & TRob, they were behind not only Cole but also the Morris Twins for spots in the post. Typically Coach Self seems to prefer a 3 man post rotation, with a fourth seeing limited minutes as foul trouble, injuries, or match-ups dictate. Cole played the role of the fourth post player his freshman year behind Shady, Darnell, & Sasha. TRob was closer to that role than Withey was this past season. Partly because Withey was not eligible until after the first semester. I also think part of it may have had to do with a comment I read from him upon becoming eligible that he still didn't know the playbook...that's after being with the team a full year at that point! The same thinking about the number of players in the rotation probably applies to EJ as well. On the '08 championship team, it was primarily 7 guys seeing minutes, Cole limited minutes as the 4th post player, & Roderick Stewart seeing minutes early due to injuries, then spot duty here & there as everyone got healthy. In the '09 season it was mainly 8 guys seeing minutes. My hope is that we might see the same kind of developement with TRob & Withey next season that we saw from Cole in '09. Given Coach Self's preference for an 8 man rotation, I'm hoping that chemistry won't be an issue next season. By my count we have 13 guys (if you include CJ Henry) and almost all will have some expectation of seeing significant minutes. There just aren't many end of the bench guys. I think Royce Woolridge is probably best off red-shirting, but there aren't many other good candidates for that like we had this year with Releford & Little. And now there's talk that we could potentially bring in Terrence Jones! Gonna be some disappointed players next year, I just hope they handle it well. The thing with Brady, you're right, technically he probably plays the small forward role. I always look at it like when you see line-ups listed on tv broadcasts, sometimes teams play 3 or even 4 guard line-ups, sometimes teams don't have a true center so they simply list 2 or 3 forward spots. Anyway, thanks for responding to my last post. Hope you enjoy this one as well. Newdiabolic316, thanks for reading and offering your comments. I will confess my opinion of Elijah Johnson is based on what I see as his potential as much as anything he demonstrated during his limited minutes on the court last season. I would compare Johnson's first season to Russell Robinson's--Robinson wasn't going to take minutes away from Aaron Miles, or even Michael Lee and Jeff Hawkins--even though I was convinced he was a better player than Lee and Hawkins. I do believe a couple things worked against both Johnson and Jeff Withey--first, they were playing behind Collins and Aldrich respectively, who were going to get minutes no matter what else happened. I am high on both EJ and JW, but realized they were going to have trouble showing what they could do. A few minutes here or there is not really an opportunity. I am speculating a little bit with my next statement--I am obviously a simple fan and not an insider--but I also wondered if perhaps the stakes were so high for the 2010 team, it kept Self from playing guys like Johnson, Withey or even Thomas Robinson to the extent he could have. I often got the feeling the team was trying to live up to its lofty rankings, and that limited some opportunities for growth and development. A good analogy might be to compare Withey, Johnson and Robinson to the Morris twins and Tyshawn Taylor. If JW, EJ and TR were newcomers in 2009 instead of Taylor and the twins, I think they would have been every bit as good and perhaps even better. Does that make sense? I would reiterate that this is just my opinion, but I think opportunities to develop the newcomers might have been missed. Brady Morningstar as a small forward? Physically that's a stretch with his lack of size and athleticism, but that is where he received most of his minutes during the last two seasons, and subsequently that's why I listed him as such. When he was on the court, he defended the other team's small forward (or tallest wing player). As a sophomore, that was his full-time position. I agree with you that Mario Little will be fun to watch, and I think he has the chance to be a terrific player. Thanks again for your comments and opinions, they are greatly appreciated. Go KU! Good read man. Think you nailed quite a few things. Only a couple of things really stood out that I disagree with. First were your comments that "Elijah Johnson has a reliable outside shot" and "Elijah Johnson does everything well." Well, Elijah shot the ball pretty horribly from beyond the arc, at a feeble 28.6% clip, nor did he display a deft shooting touch in high school. Also, I'm pretty sure his defense was lacking considerably last season, or he would have seen the court more often. Given Tyshawn Taylor's act (both with his off-court antics and poor on court performance) as well as Brady Morningstar's regression on both ends of the floor, if EJ was a capable defender Coach Self surely would have given him more floor time. All that being said, I'm really excited to see what Elijah can do next season. The small detail that I'd quibble over is listing Brady as a small forward. Anyway, again it was a good read. Personally I'm looking forward to seeing Mario Little next season. I think he's going to be a beast! Rock Chalk Jayhawk! coachb, thanks for writing. 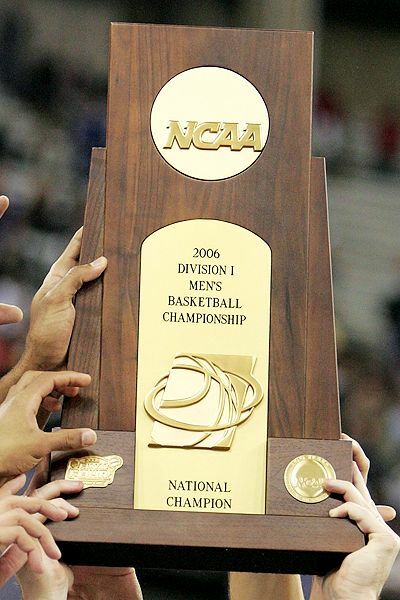 The 2010 Final Four should be well remembered for its unpredictability, and while the team I was rooting for bowed out quickly, it added an excitement to the tournament that hadn't been there in a long time. Butler was an outstanding team and deserved their moment in the sun. Perhaps it might even transform them into a "mid-major powerhouse," the way Gonzaga has been viewed for some time. Thanks again for reading, it is much appreciated. Yes, that was a heartbreaking game and the whole Final Four thing unfolded with some unpredictable teams. Duke really had to fight for that win. Who knew that Butler would challege them in such a close game? Canklefish, thanks for reading. Yup, KU blew brackets all over the country--my own included, of course. I do think KU will be good next year, and if they can get a player or two they are still in the running for, they could be very good, so it should be interesting, as always. And, Truth From Truth is a Duke fan and I've refrained from rooting for any team publicly except KU, but wouldn't it be an amazing conclusion to the season if Butler won? The loss to N.Iowa was shocking, and it blew up all 30+ of my brackets. Ya just never know with this tourney. The great thing about a storied program like KU is the fact that they always manage to reload quickly after key departures, although UNC struggled mightily this year. Oh yeah, I almost forgot... Go Butler, Beat Duke! rml, I agree with you that KU should be pretty good next year, and I'm also pleased Kentucky got beat. I have nothing against Kentucky per se, but there is something inside me that is pleased his superstar team didn't win it all. I don't know why--they were a great team and very fun to watch. Maybe it's the idea that if he won that way, he would get all the best players every season. That's his right if he can get them, of coure, but not something I would like to see happen every year. Well, anyway... next year should be interesting. Thanks for your comments. KU should be very good next year, although not necessarily as good as they were this season. At least Kentucky got beat. swosugrad09, thanks for reading. It has been a whacky year for college basketball, and I was rooting for K-State after the Jayhawks lost. Baylor is still out there, and I wonder if a Big 12 team can still crash the Final Four. Either way, I'm looking forward to next year. Thanks for your comments, I appreciate your interest. I am an Oklahoma St. fan, but I was cheering for KU all the way and felt truly sorry for their loss. Northern Iowa got lucky. Kansas should be a team to reckon with again next year. Great hub! I agree with you, there seemed to be something missing all season long with the 2010 Jayhawks, despite their impressive record. The comraderie seemed--well, contrived somehow, as if trying to appear as if they got along. I think there were some true friendships on the team, but perhaps it wasn't as close as a whole as it needed to be. Perhaps the spectre of Cole's "final year" and Xavier Henry's "one and done" agenda put too much pressure on the moment. I would also like to see Aldrich and/or Henry come back. I think Aldrich is more ready to contribute as a pro than Henry. Henry never took over a game when it mattered, and shouldn't a guy ready to play for pay be able to lead you to at least one meaningful victory? I don't say this to put him down, but I do think he doesn't yet have an NBA game, even if he has an NBA physique. I have switched to the Wildcats for the rest of the season also, and hope they go all the way. After all, they won't have to beat us to get there. Well, thanks again for your comments and insights, they are much appreciated. 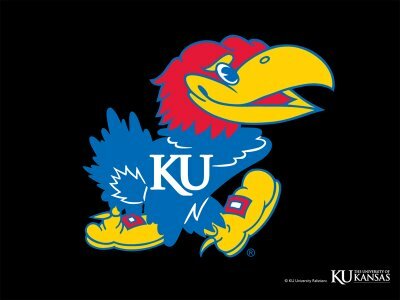 I was born and raised in Kansas and have been a Jayhawk fan for over 40 years. The loss to NI was one of the hardest to take. It just didn't seem that the team was trying to win but rather trying not to lose. I didn't see the camradarie this year as in years past. Good players, some excellent players, but KU was not a cohesive unit this year. Need to take care of discipline both on and off the court. All of the players have to have the heart to win for the team to make it. Hoping that big Cole decides that one more year in college would be better than turning pro right now. Thanks for the chance to comment - I am still licking the wounds. I guess I will just have to root for the Wildcats from the Little Apple from here on out this tournament. Paradise, thanks for reading. You're right, KU really took it on the chin this season, but I'm already cranked up for the next season. I don't want to jinx them by rooting for them, but I hope K-State wins the whole thing, now that the Jayhawks are done. KU really took a hit. Thanks for this hub, Mike. kcreery, thanks for reading. I'm hopeful that KU will be very good next year, also. Good article. KU will come back strong next year. cajunrooster, thanks for your comments. The Jayhawks this year needed a little more discipline on the court and a little more sound judgment. Hopefully they can play well next year and do a bit more in the NCAA Tournament. You're right, Self is a good coach, and they should be fine next season. This year ended on a pretty sour note, though. Kansas will always be good. Bill Self is a good coach. The Jayhawks just seem to be bitten by a bug that gets them beat in the early rounds of the tourney. That will eventually end and the team will be a force to be reckoned with. The Jayhawks always have the talent. drbj, your sympathy is appreciated. That was a pretty tough loss to watch, and it has to rank as one of the more disappointing defeats KU has endured. But, as you say, there's always next year. Janny, thanks for reading and leaving a comment. I appreciate your interest and support, especially if you're not a sports fan. It is greatly appreciated. Knowing what a KU fan you are, I feel your pain. Don't think I would have emerged unscathed after watching that game. Nice hub and you still have next year. Im not sports person but was well written. Susan, thanks for reading. If you missed the game, well--you didn't miss much from a KU fan's perspective. Next year's team should be good, though, and KU's supporters should be encouraged. I missed that game but heard about it. You added some game insight here Mike. Thanks. Paul, you said it! That was about as tough a game to watch as I can remember in a long time. So, I guess It's time to start looking ahead to next year. Man, that was a tough loss. I feel for KU fans. Next year.